Photo showing the female reincarnation Samding Dorje Phagmo Chokyi Dronma being denounced and criticised in August 1966; the person who appears to the left, behind Dorje Phagmo, casually dressed, wearing a peaked cap, holding a camera high up in the air, is Lan Zhigui. And it was only then that I took notice of something important that I had previously completely overlooked. It is really a shame that in the Chinese version of the book published in 2006 I neglected this person who appears to the left, behind Dorje Phagmo, casually dressed, wearing a peaked cap, holding a camera high up in the air. Upon close observation, I recognised the person as someone who Chinese official media called “an important person in the photographic history of the new China, someone who captured people in Tibet between the 1950s and 70s, a photography master who has produced some classic images of Tibet during this time period”. His name is Lan Zhigui. In 1949, as a 17-year old student at a Chongqing photo studio, Lan Zhigui joined the No.18 Corps of the Southwest Army Force of the PLA and in 1950, he photographed their march into Tibet. For this he “received a brand new 135 Leica camera and a 120 Rolleiflex.” In 1970, Lan Zhigui was sent to the Minjiang Machine Motor Factory in Chengdu, Sichuan Province, as a military representative by the Tibet Military Region (according to my analysis, belonging to the No. 18 Corps during the Cultural Revolution, like my father, he supported the head of the No. 18 Corps, Zhang Guohua, who would later become the commander of the Tibetan military district and the first Party Secretary of the TAR, and hereby also supported one of the two main rebel factions, the “Joint Command Faction”). In 1978 he changed profession and no longer belonged to the military. Lan Zhigui, journalist of the political division of the Tibet military district, with Lhoba people at the border area of Tibet, in 1956. In fact, my father and Lan Zhigui knew each other very well, they had both been cadres in the political division of the Tibetan military district. They also took photos together of the Lhoba people in 1956, of the Sino-Indian war in 1962 and of the great assembly for the establishment of the Tibet Autonomous Region in 1965 etc. During the Cultural Revolution, Lan Zhigui, like my father, took many photos and even worked as a professional journalist for the political division of the Tibetan military district, so he probably took even more photos of the Cultural Revolution in Tibet than my father. 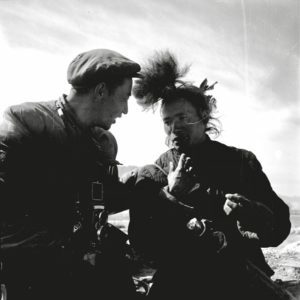 According to reports, “in 1966, during the early period of the Cultural Revolution, he took photos of the ‘Tibetan Red Guards Assembly’ and of ‘struggles against “monsters and demons.”’ He was also granted a third class award by the Political Department of Tibet Military Region of PLA.” Just as my father’s photo of the denouncing of the female reincarnation Samding Dorje Phagmo shows, Lan Zhigui was also at the scene, holding up his 120 Rolleiflex. Until his death in 2016, I only saw very few of his photos of the Cultural Revolution online and only in very recent years. They all show groups of people, but no concrete scenes; plus, at least three of the photo captions used the text that I wrote in my 2006 version of “Forbidden Memory: Tibet During the Cultural Revolution.” For example, they read: “In 1966, the Cultural Revolution erupted and there was no chance for Tibet to hide from it. Just like in other parts, there were also Red Guards rebellions, denunciations of ‘monsters and demons’ and situations of people being paraded through the streets wearing tall conical paper hats. On August 19, 1966, during a great assembly to celebrate the Cultural Revolution held in Lhasa, the place was full of Red Guard groups. The picture shows an assembly in the streets of Lhasa in 1966.” “During the Cultural Revolution, Tibetan Red Guards also ‘destroyed the Four Olds.’ On August 24, 1966, the Jokhang Temple that is known as the ‘most majestic temple across Tibet’ was destroyed by Red Guards. Statues were knocked off and thrown into Lhasa River. 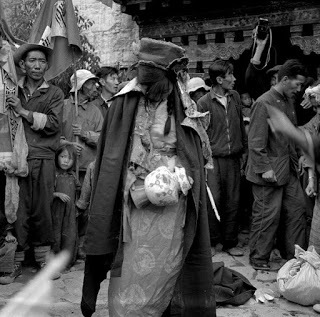 The image shows Jokhang Temple in 1966 and a Tibetan Red Guard holding red-tasselled spear” and so on. I would also like to bring up the 1980s, when I was taking preparatory classes for high school at the Southwest University for Nationalities in Chengdu. My father then assumed the post of the Vice Chief of Staff of the Kardze military sub-district and took me to the residence of Lan Zhigui at the Sichuan People’s Publishing House. This shows that they were on good terms, also privately, but I simply don’t remember what they talked about that time. I would also like to add that in the caption of the upper photo on page 21 of the newly published version of “Forbidden Memory: Tibet During the Cultural Revolution” (published by Locus in Taiwan under the title “Forbidden Memory: 25 Years Cultural Revolution Anniversary Commemoration”), I point out that the person who took the photo of the monks reciting prayers was a Tibetan photographer stationed at the Tibetan correspondent post of the Central Newsreel and Documentary Film Studio. On a new photo added to page 26, we can see that at the assembly in Lhasa celebrating the Cultural Revolution, there were at least three photographers and camera men, from left to right, they were: a photojournalist from the “Tibet Daily,” a Tibetan photographer stationed at the Tibetan correspondent post of the Central Newsreel and Documentary Film Studio and a photographer who looked very much like Lan Zhigui himself. In the caption on page 97, I also point to several people who captured scenes of the fight against “monsters and demons,” including photojournalists from the “Tibet Daily” and Xinhua sub-divisions in Tibet. In the end, however, through my research and fieldwork about the Cultural Revolution in Tibet, I concluded: “We did not see a single photo of the struggle against ‘monsters and demons’ in any newspapers at the time;” in fact, this is still the case today. My father was by no means a professional photojournalist, he had purchased his 120 Zeiss Ikon at a store in Lhasa’s Barkhor from the military provisions he had saved for two years. Also, even though my father was not the only person at the time who took photos of the Cultural Revolution in Tibet and even though he did not capture all of the events, until the present day, the almost 300 photographs that he took and that were published in my book still represent the most comprehensive photographic record of the Cultural Revolution in Tibet. 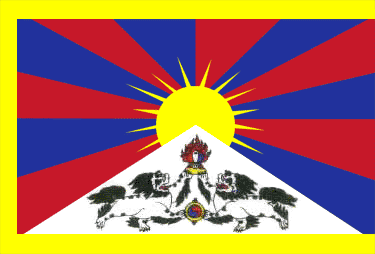 What is very interesting, however, is what a “Tibetan contemporary photography historian” stated on the Chinese internet: “In July 1951, when the Chinese PLA peacefully entered Tibetan areas, over 20 photographers and photojournalists accompanied the troops; they belonged to the very first group of photographers taking images of Tibet after the establishment of the new China;” subsequently, the names of these photographers were listed one by one. My father, however, who has already published hundreds of photos of the Cultural Revolution in Tibet, is not mentioned. I believe that this is not because the author is oblivious, but that it is a very deliberate negligence. I know this because if they simply did not know, they would not have used my photo captions from “Forbidden Memory: Tibet During the Cultural Revolution” when introducing Lan Zhigui’s Cultural Revolution photos.